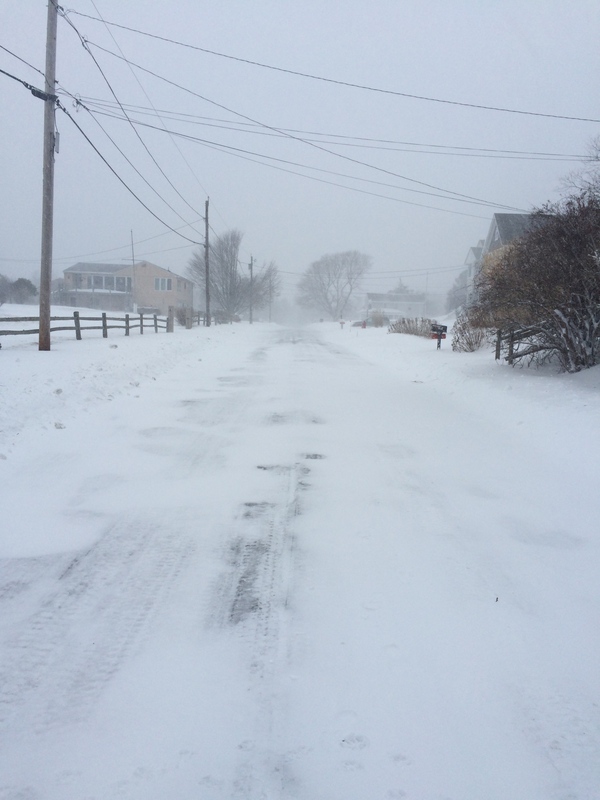 The “blizzard of 2015” continues here in coastal Rhode Island. It’s hard to know how much snow we have received, but the weather service says it’s between 1 1/2 to 2 feet. 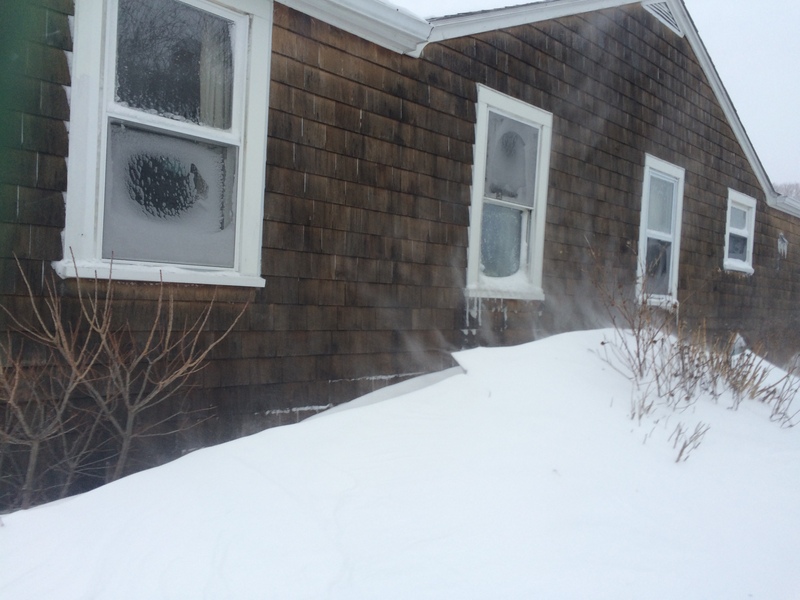 The wind is a big problem, blowing it all around into drifts. My biggest fear was losing power, but so far we haven’t, thanks largely to the light, dry quality of the snow, which didn’t weigh down tree branches or power lines. My second biggest worry was taking the dog out first thing this morning. I ended up shoveling a path through a drift at our steps, and once we got to the driveway, the man had come to plow so we just walked to the road. 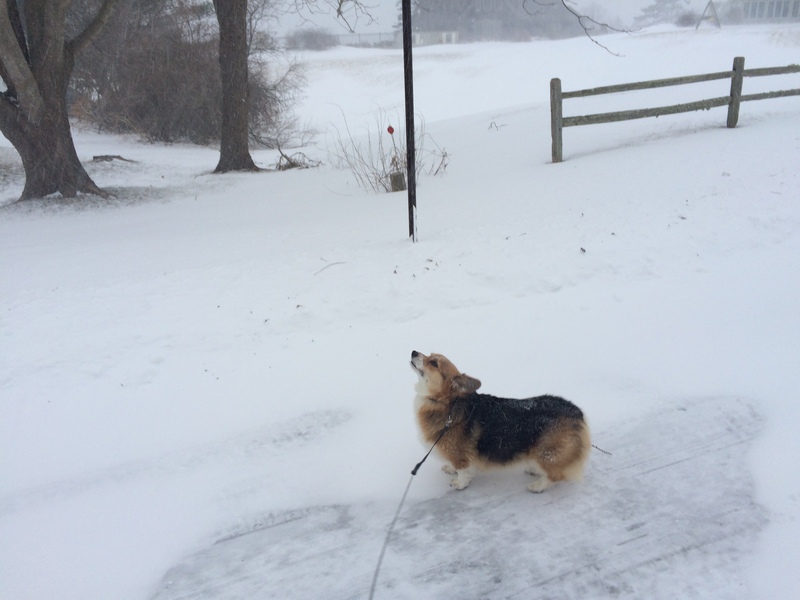 She didn’t like the stinging snowflakes blown into her eyes by the wind, but she performed like a trooper anyway. Look at that face. No doubt what she’s thinking. Once we got out onto the road, she was happier. I was anticipating lots of hungry birds and put out food accordingly. Despite being buffeted by the wind, they stuffed their beaks. I even had a common redpoll feeding with the goldfinches, the first I have ever seen in RI. Here’s a shot of the birds taken through the window. Two juncoes on the left and a song sparrow on the right. There’s still a total travel ban here, so I cannot go anywhere. Yay! As long as I am warm, I can deal with the rest. Yes, it’s a redpoll year. My sister in Quebec said they arrived at her feeders last week in the hundreds – which happens to her every couple of years. She goes through a TON of thistle seed. This was the first redpoll I had ever seen down here on the coast. Storms are cool that way. You never know what’s going to show up at the feeders. 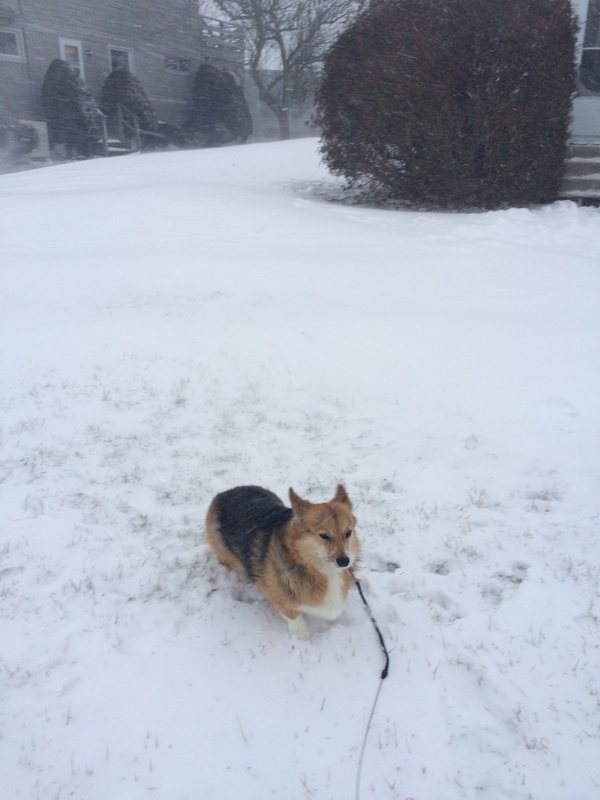 Your dog is a trooper. The birds were definitely clamoring for seed this morning. No redpolls here, though a beautiful flicker deigned to hang out with the crowd yesterday for some reason. And a lone grackle who was looking like he regretted his decision not to migrate south. I went out with a yardstick and the snow here (Bradford, RI) mostly seems to range between 12 inches to 20 in the drifts. It is indeed a good day to stay home. I’m baking some bread. I made a Thai sweet potato stew. As long as there’s power, there’s cooking, thank goodness. I just had 1 redpoll, but that’s better than none. 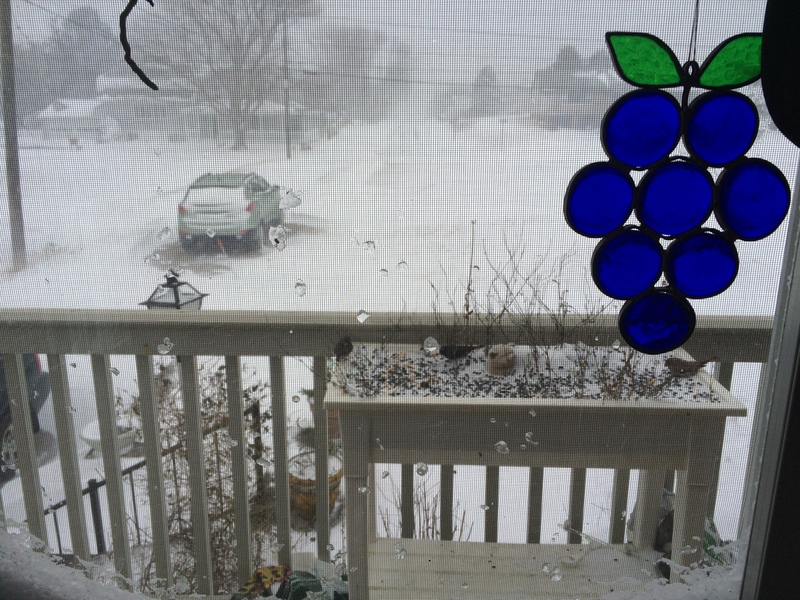 Great update….I always worry about the birds…from when I was little I watched my mom feed the birds …I am doing the same….and teaching my grandchildren….I was disappointed this year. .never got one hummingbird visit my hummingbird feeder. Wonder why? What a snow day, dn! Thank goodness, all is well for you and you’re safe and cozy. Thanks for thinking of us, CJ. The power thing was key. Without that, we would have had to evacuate. Heat and light are so primal, no? Here’s your pesty friend again telling you to get a generator! LOL. No kidding; one less worry is a good thing! If you only knew how many times I have told my husband we need a generator. This is a sore spot in our relationship, especially since he was out of town on business during this last storm and I had to worry all by myself. In other words, don’t get me started. We deal with loadshedding, and make a plan to survive without power. We are fine, as long as we have power. I hate being so vulnerable. Hope you are happy in your new home.